Nicolás Carreto-Molina, Pablo García-Solís, Juan Carlos Solís-S, Ludivina Robles-Osorio, Hebert Luis Hernández-Montiel, Genaro Vega-Malagón. Iodine is an essential constituent of thyroid hormones (TH). TH actively take part in critical periods of brain development during embryonic, fetal and postnatal stages. Therefore the absence of TH or iodine in these critical periods produces an irreversible brain damage. In fact, it is known that iodine deficiency is the leading cause of preventable brain damage worldwide. Because of the physiological adjustments during pregnancy iodine requirements increase significantly from 150 μg per day in non-pregnant adult women to 250 μg per day. Moreover, recent epidemiological studies around the world show that iodine intake during pregnancy is insufficient in many countries, even in developed countries like Australia, Spain and Italy. In the present work an overview of the importance of iodine nutrition during pregnancy is given. Key words: Pregnancy, thyroid hormones, nutrition, iodine. El yodo es un nutrimento constituyente indispensable de las hormonas tiroideas (HT). Las HT participan activamente en periodos críticos del desarrollo cerebral durante las etapas embrionaria, fetal y posnatal. Por lo tanto la ausencia o deficiencia de las HT o de yodo en estas etapas del desarrollo produce un daño cerebral irreversible. De hecho, se sabe que la deficiencia de yodo es la principal causa de daño cerebral prevenible en el mundo. Debido a los ajustes fisiológicos propios de la gestación los requerimientos de yodo se incrementan notablemente, pasando de 150 μg al día en la mujer adulta no gestante a 250 μg al día durante el embarazo. Por otra parte, estudios epidemiológicos recientes hechos en todo el mundo muestran que el consumo de yodo durante la gestación es insuficiente en varios países; incluso en países desarrollados como Australia y España e Italia. En la presente revisión se da un panorama general de la importancia del consumo adecuado de yodo durante la gestación. Palabras clave: Gestación, hormonas tiroideas, nutrición, yodo. Departamento de Investigación Biomédica, Facultad de Medicina de la Universidad Autónoma de Querétaro. Querétaro. México. The role of iodine during pregnancy is of great interest because this halogen participates in the development of the central nervous system during embryonic, fetal and postnatal stages (1-3). Iodine is an essential constituent of thyroid hormones (TH), thyroxine and triiodothyronine, thus its deficiency gives rise to a group of diseases generically called iodine deficiency disorders or IDD (4). Table 1 shows a list of IDD, which notably include conditions involving neurodevelopment, brain function and reproduction. Currently, it is considered that iodine deficiency is the leading cause of preventable brain damage in the world (4, 5). In this regard, it is estimated that more than 2 billion people have inadequate iodine consumption (5). For the eradication of iodine deficiency two fundamental strategies have been established, universal salt iodization and continuous epidemiological surveillance (6). Universal salt iodization implies that all salt used for human consumption (table salt and food industry) and livestock must be iodized (6). Epidemiological surveillance mainly consists of periodically assessing the concentration of iodine in table salt, in addition to the determination of the consumption of iodine, which is measured by the urinary iodine concentration (UIC). UIC surveillance must be performed in children between 6 and 12 years of age, and this monitoring is recommended every five years (6). Modified from references 4 and 6. Pregnant women are vulnerable to iodine deficiency because this physiological condition significantly changes thyroid economy in relation to non-pregnant women (7). Among the most significant changes in thyroidal physiology during pregnancy are the following (7, 8): 1) an increased renal clearance of circulating iodine due to an increase in glomerular filtration rate; 2) an increase in serum thyroxine-binding globulin (TGB) generated by the increase in circulating estrogens, which in turn decreases free thyroxine and consequently increases the levels of thyroid stimulating hormone (TSH), directly stimulating TH synthesis by the thyroid gland; 3) an increase in TH synthesis by chorionic gonadotropin (hCG), due to its binding and activation of the TSH receptor by its similarity to this hormone. These three phenomena result in an increase of up to 50% of circulating TH in pregnancy compared to nonpregnant women. All these changes in thyroid physiology during pregnancy have resulted in an increase in iodine requirements. Table 2 shows the recommended daily iodine intake by age group. During the first trimester of pregnancy the fetus depends on maternal thyroxine provided transplacentally; and at the last stage of pregnancy the fetus can synthesize its own TH, however still depends on the iodine transferred by the mother. Studies in laboratory animals clearly show that severe iodine deficiency during pregnancy causes maternal hypothyroxinemia that directly affects brain development in the offspring (2). In humans it is established that the first trimester of pregnancy is the point of greatest vulnerability to iodine deficiency (8). TH have an important role in neurodevelopment (2, 3). They take part in neurogenesis, neuronal migration, myelination and cortical maturation. Such effects of TH in the brain occur at critical periods of development, therefore its deficiency during embryonic, fetal and postnatally at the first few months of life cause irreversible alterations on psychomotor development whose ultimate expression is endemic cretinism (mental retardation and psychomotor irreversible damage) (2-4). Currently it is agreed that the best indicator for assessing iodine nutritional status is through the median UIC obtained from casual urine samples of a representative sample population (6). Tables 3 and 4 show the epidemiological criteria for categorizing iodine nutritional status by using the median UIC in schoolchildren and pregnant women, respectively. Median UIC in schoolchildren between 6 and 12 years of age is the mainly indicator of iodine nutrition in a general population because it usually reflects the iodine intake adequately (5, 6). * WHO, UNICEF, ICCIDD (6). 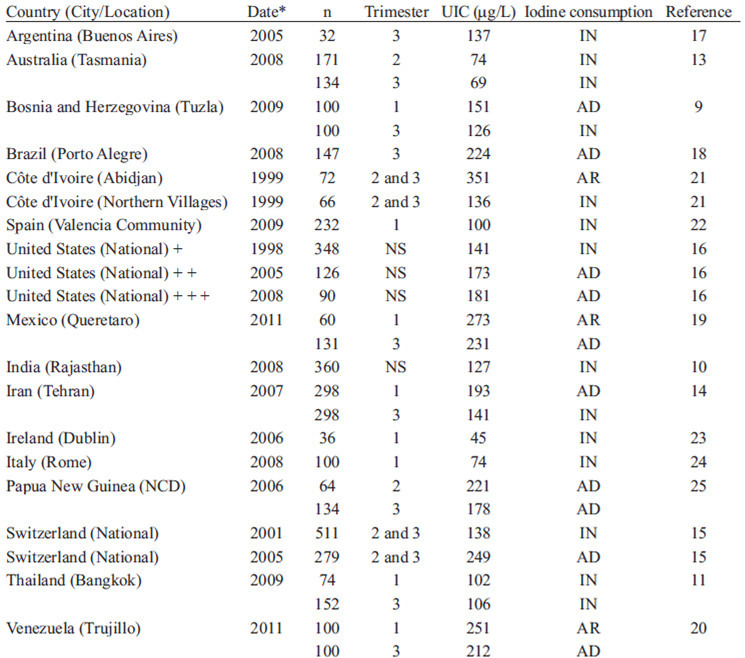 Several countries in recent years have analyzed the iodine nutritional status during pregnancy (see Table 5) (9-25). On one hand, it has been shown that countries without a program of universal salt iodization have less than optimal iodine nutrition during pregnancy (for example Bosnia and Herzegovina, India and Thailand) (9-11). On the other hand, countries like Australia and Iran, with programs of universal salt iodization, show that this type of program may not be sufficient to reach the optimal iodine intake (12-14). * Date: Year of publication; ** Gestational age: 15-19 weeks; + National Health and Nutrition Examination Survey (NHANES) III 1988-1994; + + NHANES 2001-2002 + + + NHANES 2003-2004. United States: United States of America; AD: adequate, AR: above requirements; IN: inadequate; NS: Not specified. NCD: National Capital District. A study in Tasmania showed that the addition of iodine to salt and bread effectively corrected the deficiency of this halogen in the general population; however this strategy was not effective in correcting the insufficient iodine intake during pregnancy (12). In contrast, countries like Switzerland and the United States of America without programs of universal salt iodization reach an adequate iodine consumption (15, 16). These developed countries, however, have permanent monitoring systems that allow the implementation of corrective actions on its population in case of deficiency. In the United States of America there has been detected a significant reduction in UIC in the last 40 years (Table 5) (16). It is noteworthy that the current UIC values are close to the minimum value of iodine sufficiency (see Tables 4 and 5). In fact, the American Thyroid Association recommends to people of the United States of America and Canada that pregnant women should receive 150 μg of iodine in vitamin supplements (1). In Latin America, countries like Argentina, Brazil, Mexico and Venezuela have recent data about iodine nutrition during pregnancy in some regions (17-20). In Argentina (Buenos Aires) the median of UIC was < 150 μg/L whereas in Brazil (Porto Alegre), Mexico (Queretaro) and Venezuela (Trujillo) there was a median UIC >150 μg/L. In all these Latin American countries the universal salt iodization is mandatory (26). In addition, there is a considerable decline in UIC at the end of pregnancy; several countries like Bosnia and Herzegovina, Iran and Thailand have exhibited this type of behavior (9, 11, 14). The reduction in median UIC at the end of pregnancy is most evident in places where there is a clear iodine deficiency (13). A study in Tasmania showed that at the beginning of pregnancy a 22% of samples had UIC levels < 50 μg/L and 40% at the end (13). This decline could suggest a depletion of iodine storage due to its consumption by the maternal-fetal binomial, its renal elimination and/or by inadequate dietary compensation. Several studies have showed that the use of the median urinary iodine between 100-199 μg/L in schoolchildren as an indicator of iodine nutrition is not useful as an indicator of adequate intake of iodine during pregnancy in the same regions (5, 6, 10-12, 15-17, 20, 21). In Table 6, as an example, is shown a comparison between median of UIC of schoolchildren and pregnant women in three studies performed in Latin American countries, Argentina (Buenos Aires), Mexico (Hidalgo) and Venezuela (Trujillo) (17, 20, 27, 28). It was found that in Buenos Aires the iodine intake is adequate in schoolchildren but insufficient in pregnant women; whereas in Trujillo a Venezuelan Andean region the iodine intake is adequate in both groups. The WHO, UNICEF and ICCIDD have appealed to the importance of regular monitoring of iodine nutrition during pregnancy and not just in schoolchildren (6). TABLE 6 Comparison of the median UIC in schoolchildren and pregnant women in three Latin American countries. The values represent the median UIC in μg/L, the number of subjects for each group was ≥ 32. Data from schoolchildren and pregnant women were obtained at the same time and by the same research group. Data were rounded from the original reference to the nearest number (17, 18, 27, 28). International agencies recommend that each country should have its own studies on iodine nutritional status in vulnerable populations with the aim to make decisions and public policies based on well founded information (6). In Mexico, very little is known about the consumption of iodine in both schoolchildren and pregnant women. In this regard, the latest national nutrition survey which collected data on iodine nutrition was performed in 1999 and showed a median UIC, in schoolchildren and non-pregnant women, of 231 and 281 μg/L, respectively (29). Both data indicate a consumption of iodine above requirements. However, a study of Castañeda et al. (27) published in 2002 revealed that pregnant women in three localities of the Mexican state of Hidalgo: Pachuca (capital city), Ixmiquilpan (rural area without endemic goiter) and Huejutla (rural area with endemic goiter), showed a median UIC of < 150 μg/L, indicating insufficient iodine intake (Table 6). While in schoolchildren the median UIC was >100 μg/L in Pachuca and Ixmiquilpan, and <100 μg/L in Huejutla (Table 6) (28). In contrast, nine years later, our research group conducted a study on iodine nutritional status in 294 pregnant women in the state of Queretaro, Mexico, and found an overall median UIC of 260 μg/L (19). Our recent data in contrast to those of Hidalgo indicate an iodine intake above requirements in pregnant women. This discrepancy could be explained because of the development of an extensive program of universal salt iodization in Mexico. Currently it is estimated that 80% of the table salt consumed in Mexico contains between 20 and 40 ppm of iodine, and only around of 10% of this salt contains less than 15 ppm of iodine (30). The universal salt iodization is the most cost-effective strategy to guarantee iodine consumption in general population (6). At present the minimal iodine concentration recommended for table salt is 15 ppm. In this regard for a non-pregnant woman which only iodine source is table salt, 10 g of table salt are needed daily to reach the recommended consumption (150 μg) (6). This implies the consumption of approximately 17 g of table salt for a pregnant woman in order to reach its recommended daily intake (250 μg). Considering the current global trend of reducing salt intake of 10 g/day per capita to less than 5 g/day in order to prevent cardiovascular diseases (31), it is very important to adequately monitoring iodine intake in pregnant women. It is essential not to jeopardize the sufficiency of iodine intake by the reduction of salt intake. As alternatives it should be considered to increase the minimal concentration of iodine in table salt or to establish additional iodine supplementation (multivitamin) in pregnant women. In this regard, it has been documented that salt restriction may compromise iodine intake in pregnant women (9). Larger studies are needed in all the countries to identify patterns of iodized salt intake, and to evaluate other iodine food sources to ensure an adequate iodine intake. In relation with iodine metabolism in pregnant women with preeclampsia (PE), to our knowledge there is only one study that analyzed UIC (32). This study showed that UIC of women with severe PE is lower than in normal pregnant women, 42.5 ± 27 μg/L versus 208 ± 64 μg/L. This same group found that the concentration of triiodothyronine and iodine in serum, and the concentration of iodine in placenta of women with severe PE were lower than in normal pregnant women (32-34). Indeed, several studies suggest that the placenta may act as a storage place for the supply of iodine to the fetus (35). The previous data suggest that pregnant women with PE have a significant degree of iodine deficiency. In contrast, it has been reported that iodine concentration in blood from the umbilical cord of women with PE is higher than in healthy pregnant women (33). This suggests an adjustment in the physiological mechanisms that favor the passage of iodine to the fetus. In this regard, the supply of iodine to the fetus depends not only on the iodine intake in the mother, but also on the ability of iodine to cross the placenta and on its incorporation into TH by the fetus (35). Adequate iodine intake during pregnancy is essential to ensure proper brain development and its deficiency in critical periods generates irreversible damage. Iodine metabolism during pregnancy is different from the non-pregnant woman, and this physiological scenario should be taken in account for an adequate nutritional assessment. The UIC determination in the general population for the monitoring of iodine consumption is essential for the design and application of policies directed to ensure an adequate iodine intake. The use of iodine supplementation (multivitamins) in pregnancy should be considered specially when the consumption of table salt is reduced. This work was partially supported by grants: FOMIX-QRO-2009-C01-117897 and PROMEPPTC-094. Public Health Committee of the American Thyroid Association, Becker DV, Braverman LE, Delange F, Dunn JT, Franklyn JA, et al. Iodine supplementation for pregnancy and lactation-United States and Canada: recommendations of the American Thyroid Association. Thyroid. 2006; 16(10): 949-951. Berbel P, Obregón MJ, Bernal J, Escobar del Rey F, Morreale de Escobar G. Iodine supplementation during pregnancy: a public health challenge. Trends Endocrinol Metab. 2007; 18(9): 338-343. Zimmermann MB. Iodine deficiency in pregnancy and the effects of maternal iodine supplementation on the offspring: a review. Am J Clin Nutr. 2009; 89(suppl): 668S-672S. Zimmermann MB. Iodine deficiency. Endocr Rev. 2009(4); 30: 376-408. Benoist B, McLean E, Andersson M, Rogers L. Iodine deficiency in 2007: global progress since 2003. Food Nutr Bull. 2008; 29(3): 195-202.
WHO, UNICEF, ICCIDD. Assessment of iodine deficiency disorders and monitoring their elimination. A guide for programme managers. 3rd ed. Geneva (Switzerland): WHO, 2007. 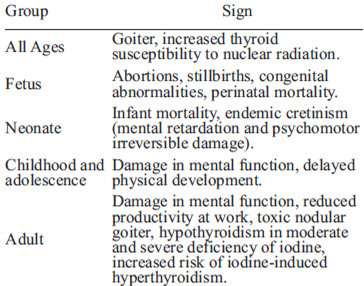 Glinoer D. Pregnancy and iodine. Thyroid. 2001; 11(5): 471-81. Glinoer D. The Importance of iodine nutrition during pregnancy. Public Health Nutr. 2007; 10(12A): 1542-6. Tahirović H, Toromanović A, Balić A, Grbić S, Gnat D. Iodine nutrition status of pregnant women in an iodinesufficient area. Food Nutr Bull. 2009(4); 30: 351-354. Ategbo EA, Sankar R, Schultink W, van der Haar F, Pandav CS. An assessment of progress toward universal salt iodization in Rajasthan, India, using iodine nutrition indicators in school-aged children and pregnant women from the same households. Asia Pac J Clin Nutr. 2008; 17(1): 56-62. Gowachirapant S, Winichagoon P, Wyss L, Tong B, Baumgartner J, Melse-Boonstra A, Zimmermann MB. Urinary iodine concentrations indicate iodine deficiency in pregnant Thai women but iodine sufficiency in their school-aged children. J Nutr. 2009; 139(6): 1169-72. Burgess JR, Seal JA, Stilwell GM, Reynolds PJ, Taylor ER, Parameswaran V. A case for universal salt iodisation to correct iodine deficiency in pregnancy: another salutary lesson from Tasmania. Med J Aust. 2007; 186(11): 574-6. Stilwell G, Reynolds PJ, Parameswaran V, Blizzard L, Greenway TM, Burgess JR. The Influence of gestational stage on urinary iodine excretion in pregnancy. J Clin Endocrinol Metab. 2008; 93(5): 1737-1742. Ainy E, Ordookhani A, Hedayati M, Azizi F. Assessment of intertrimester and seasonal variations of urinary iodine concentration during pregnancy-in an iodine-replete area. Clin Endocrinol (Oxf). 2007; 67(4): 577-81. Zimmermann MB, Aeberli I, Torresani T, Burgi H. Increasing the iodine concentration in the Swiss iodized salt program markedly improved iodine status in pregnant women and children: a 5-y-prospective national study. Am J Clin Nutr. 2005; 82(2): 388-92. Caldwell KL, Miller GA, Wang RY, Jain RB, Jones RL. Iodine status of the U.S. Population, National Health and Nutrition Examination Survey 2003-2004. Thyroid. 2008; 18(11): 1207-1214. Prieto L, Méndez V, Chiesa A, Bengolea S, Gruñeiro-Papendieck L. Determinación de yoduria en la población materno infantil de Buenos Aires. Rev Argent Endocrinol Metab. 2005; 42(4): 131-36. Soares R, Vanacor R, Manica D, Dorneles LB, Resende VL, Bertoluci MC, Furlanetto TW. Thyroid volume is associated with family history of thyroid disease in pregnant women with adequate iodine intake: a cross-sectional study in southern Brazil. J Endocrinol Invest. 2008; 31(7):614-7. García-Solís P, Solís-S JC, García-Gaytán AC, Mendoza-Reyes VA, Robles-Osorio L, Hernánez-Montiel HL, Leo-Amador GE. Iodine nutrition status in pregnant women in Mexico. Thyroid. 2011; 21(12): 1367-71. Caballero L. Yoduria en escolares y embarazadas del estado Trujillo, Venezuela 2007-2008. Rev Argent Endocrinol Metab. 2011; 48(4): 206-11. Hess SY, Zimmermann MB, Staubli-Asobayire F, Tebi A, Hurrell RF. An evaluation of salt intake and iodine nutrition in a rural and urban area of the Côte d'Ivoire. Eur J Clin Nutr. 1999; 53(9): 680-686. Peris Roig B, Calvo Rigual F, Tenias Burillo JM, Merchante Alfaro A, Presencia Rubio G, Miralles Doltz F. Embarazo y deficit de yodo. Situación actual. Current situation. Endocrinol Nutr. 2009; 56(1): 9-12. Nawoor Z, Burns R, Smith DF, Sheehan S, O’Herlihy, Smyth PP. Iodine intake in pregnancy in Ireland -- a cause for concern? Ir J Med Sci. 2006; 175(2): 21-4. Marchioni E, Fumarola A, Calvanese A, Piccirilli F, Tommasi V, Cugini P, et al. 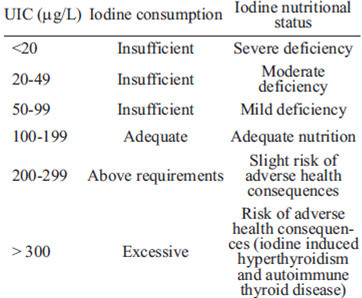 Iodine deficiency in pregnant women residing in an area with adequate iodine intake. Nutrition. 2008; 24(5): 458-61. Temple VJ, Haindapa B, Turare R, Masta A, Amoa AB, Ripa P. Status of iodine nutrition in pregnant and lactating women in National Capital District, Papua New Guinea. Asia Pac J Clin Nutr. 2006; 15(4): 533-7. Pretell EA, Delange F, Hostalek U, Corigliano S, Barreda L, Higa AM, et al. Iodine nutrition improves in Latin America. Thyroid. 2004;14(8):590-9. Castañeda R, Lechuga D, Ramos RI, Magos C, Orozco M, Martínez H. Endemic goiter in pregnant women: utility of the simplified classification of thyroid size by palpation and urinary iodine as screening tests. BJOG. 2002; 109(12): 1366-1372. Martínez-Salgado H, Castañeda-Limones R, Lechuga-Martin del Campo D, Ramos-Hernández RI, Orozco-López M, Rivera-Dommarco J, et al. Deficiencia de yodo y otros posibles bociógenos en la persistencia del bocio endémico en México. Gac Med Mex. 2002; 138(2): 149-156. Rivera J, Shamah T, Villalpando S, González de Cossío T, Hernández B, Sepúlveda J. Encuesta Nacional de Nutrición 1999. Estado nutricio de niños y mujeres en México. Cuernavaca (Morelos, Mexico): Instituto Nacional de Salud Pública, 2001. Comisión Federal para la Protección contra Riesgo, Secretaria de Salud [Internet]. México: Programa: Alimentos. Proyecto: Sal yodada y fluorada. 2012 - [cited 14 January 2012]. Available: http://www.cofepris.gob.mx/Lists/Alimentos/AllItems.aspx. WHO. Reducing salt intake in populations: report of a WHO forum and technical meeting, 5-7 October 2006, Paris, France. Geneva (Switzerland): WHO, 2007. Gulaboglu M, Borekci B, Delibas I. Urine iodine levels in preeclamptic and normal pregnant women. Biol Trace Elem Res. 2010; 136(3): 249-57. Borekci B, Gulaboglu M, Gul M. Iodine and magnesium levels in maternal and umbilical cord blood of preeclamptic and normal pregnant women. Biol Trace Elem Res. 2009; 129(1-3): 1-8. Gulaboglu M, Borekci B, Halici Z. Placental tissue iodine level and blood magnesium concentration in preeclamptic and normal pregnancy. Int J Gynaecol Obstet. 2007; 98(1-3): 100-4. Burns R, O'Herlihy C, Smyth P. The placenta as a compensatory iodine storage organ. Thyroid. 2011; 21(5): 541-6.